“Rise and Shine New York City” – ahhh Shaw Contract Group, one of this year’s sponsors, you could not have said it better this morning. The Interiors Awards breakfast, presented by Contract Magazine is a favorite event in our industry, despite the early 7:30am commencement. Over 700 of us sprung from our beds at ungodly hours to celebrate the best in commercial design. As always, it was well worth the trip to Cipriani. The staff at Contract put together a great video presentation. We saw 14 fabulous projects and honored two of the unsung heroes in our field: Legend Award Winner: Moira Moser of M Moser Associates and Designer of the Year: Phillip G. Freelon of The Freelon Group. 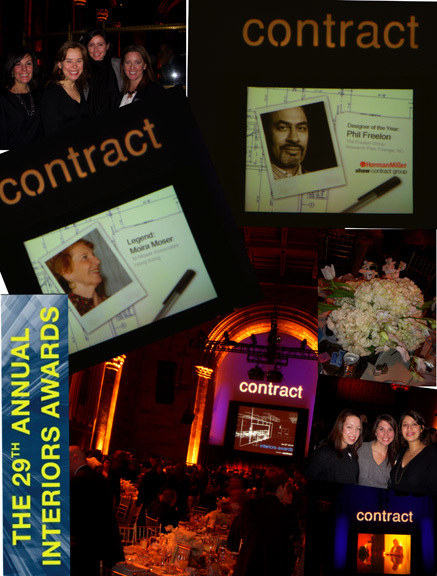 According to the well-spoken and talented Freelon (whose picture is on the cover of Contract’s January issue), “Architecture is like frozen music.” So we are happy to sing the praises of all of the 2008 winners.